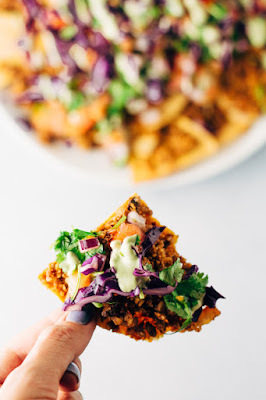 Vegan loaded nachos - I'm your number one fan. Nachos are always a good idea... but when it's borderline summer time and cinco de mayo is just a few days away.. nachos sound like an even more fantastic idea altogether. The best homemade vegan loaded nachos recipe ever. You won’t need another. Loaded with homemade vegan sundried tomato walnut meat, simple pico de gallo, and nacho cheeze sauce. Recipe is flexible – feel free to get creative and add your own toppings! 1 bag of Tortilla chips (or you can make these oil free homemade tortilla chips). Homemade sundried tomato walnut taco meat or your favorite store-bought vegan meat alternative such as Gardein Meatless Ground Beef Crumbles – but keep in mind store bought varieties usually include sugar and oils. Homemade is best. Simple Pico De Gallo (a handful of cilantro, 1-2 tomatoes, half of a red onion, 1 garlic clove and the juice of one lime) or you can use store bought chunky salsa. 1/2 cup to 1 cup Guacamole (if you want to make your own, check out this homemade guac using your food processor) For a quick an easy guac: Smash up one avocado with a fork and add the juice of one lime, and sprinkle with salt if desired. You can also just use avocado slices instead of guac if you prefer. 1/8 teaspoon (1g) of chipotle pepper powder (you can also use cayenne pepper, I prefer the chipotle flavor though). Also, if you like lots of spice feel free to add more but I feel with 1/8 tsp it is spicy enough, so taste test first and then adjust. 1/4 teaspoon of salt or more, adjust as needed. This vegan green cilantro garlic sauce, so yum! *If you are not making everything from scratch then you can skip to step #3 and begin there. Begin by making your tortilla chips as instructed in this recipe. While your chips are baking in the oven – go ahead and make the walnut meat as instructed in this recipe. I usually pop my walnut meat in the oven while the chips are baking as well. Next go ahead and make the pico de gallo by chopping all ingredients, placing them in a bowl and coating them with the juice of one lime. Make the guac by mashing up the avocado with a fork and squeezing the juice of one lime (or lemon) and mixing. Set aside. Make the nacho cheeze sauce – throw all ingredients in your blender and process until smooth. Finally, once chips are ready, walnut meat has roasted, and all the toppings are ready to go – layer your nachos in this order (or any order really, but I like this order in particular): place chips on a plate, then add the walnut meat (or your store bought version) on top, next add the pico de gallo or chunky salsa, add a dollop of guacamole or avocado slices and drench – I mean drizzle – with the nacho cheeze sauce or store-bought vegan cheese. Add any additional toppings you like. It is now time to DIG in and enjoy. This recipe is very flexible – feel free to use your own toppings and quantities. If your cheeze sauce is not very ‘pour-able’, you can add a bit more veg broth or water one tablespoon at a time until you reach a thinner consistency. I find that 1/2 cup of veg broth works great but feel free to adjust as needed. If you do not have a powerful blender it is always recommended that you soak the cashews for at least 20 to 30 minutes so that you can achieve ultimate creaminess factor. If you have a vitamix, blendtec, or another powerful high-speed blender you don’t need to soak. If spicy sauce is not your thing – you can try these with this cilantro garlic sauce instead. 0 Response to "The Best Homemade Vegan Loaded Nachos Recipe Ever"